This is a great ocean waves recording for several reasons. First, the sound quality is awesome. With headphones on, you'll swear you are right there on the beach. Second, the recording is long: 73 continuous minutes of the sound of the surf without track changes or interruptions. Third, there are no extraneous sounds like squawking birds. Only the natural sound of the surf is featured - no wildlife sounds or musical accompaniment. There is a fade in and a fade out at the end to allow smooth repeat play. This disc provides a totally natural, rhythmic, and calming sleep-promoting atmosphere. This CD is a great tool to mask the irritating and irregular nuisance noises of traffic, lawnmowers, and barking dogs. 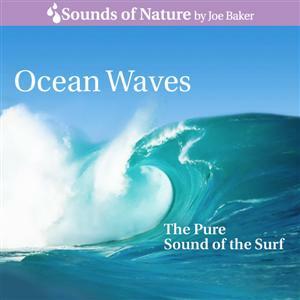 There are many other sound recordings of ocean waves on the market. Unfortunately many are not suitable for sleeping. Many contain the sounds of squawking seagulls or distant boats. Bird noises are not natural for nighttime, instead they signal the time to wake. Many ocean waves recordings attempt to magnify the dynamic range of the sound of the surf such that the waves crash at a thunderous volume with near silence afterwards. This recording has no such manipulation. Instead, this recording replicates exactly what you would hear if you were sitting on the beach on a warm, wind-free summer night. This is also a great CD for getting a baby to sleep. There are no volume spikes. Please put on your headphones and listen!